While it may not feel like it now, spring is just around the corner. The avid gardener is already thinking about what type of produce they will plant in the garden. Bell peppers are a given for many, but what color? 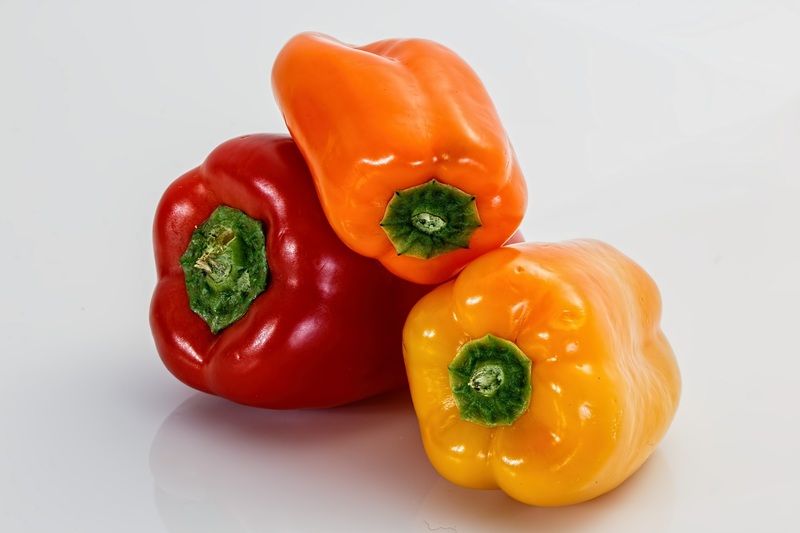 Mature bell peppers can be red, orange, yellow or green. However, all peppers start out green before turning color as they mature. The rate at which they will turn color and mature is dependent upon the variety. For instance, the Gypsy variety takes just 65 days to mature and will go from green to pale yellow to orange to red. Different colors will yield a slightly different taste, price and nutrient profile. Since green peppers are immature, they're harvested sooner, yielding a pepper that is less sweet, a bit lower in nutrients (less vitamin A and vitamin C than in red mature peppers), but less pricey. Yellow will be slightly sweet, orange mildly sweet and red the sweetest. With all the beautiful bright colors, bell peppers make it easy to add color to the plate. They can be eaten raw as a snack or in a salad. Try them in a stir-fry or fajitas. Throw them in soups, omelets or on top of pizzas. Stuff them with brown rice, vegetables, beans and seasonings. Choose peppers with firm skin without wrinkles. Store whole peppers in a plastic bag in the vegetable crisper of the refrigerator for up to one week. Once cut, place peppers in a sealed plastic bag and store in the refrigerator for up to three days. Choose your garden pepper and marvel in the many ways to use them! Cook beef and onion in large stewpot until beef is no longer pink. Drain well. Add remaining ingredients, except rice and cheese. Simmer for 30 minutes. Add cooked rice and simmer for an additional 10 minutes. Serve topped with mozzarella cheese, if desired.